I hope everyone had a wonderful Thanksgiving Holiday Weekend and that you all managed to get some time to relax and start to get in the holiday mood with family and friends. I would like to sincerely thank every one of you who placed orders with us over the long weekend, as a small business owner it really means a lot to me personally. My husband Tim and I were hosting Thanksgiving dinner in the early evening at our house for my immediate family. We spent most of the day on Thursday in the kitchen prepping and cooking the meal which turned out well and then enjoyed the left overs over the weekend. Tim and I ventured out a little bit on Saturday with friends and even did a bit of shopping. We visited the brand new Palisades Village which is a relatively new small walk-able “village” with many uniquely curated specialty boutiques, restaurants and a movie theater in a beautiful open-air setting. As for today’s outfit, I want to introduce you to our brand-new, super chic Glen Plaid Coat. This is a great coat, made out of a beautiful glen plaid fabric in gray, black, ivory and a bit of red combo. The body is loose and slightly over-sized. As you all know I love doing fun linings in my jackets and coats and this coat is no exception with its camouflage lining that gives it an edgy twist. This is a great piece to wear casually or dress up for different occasions. I am wearing it with my faux leather pants and our new Pearl Peasant Blouse with Metallic Stripes, which is a very pretty blouse we have just added to our shop. The fabric is sheer with delicate silver and gold stripes woven in. However, the body is fully lined, so you don’t have to worry about wearing a camisole underneath. The lining is a bit shorter than the top, as you can see the photos below. The sleeves are three quarter length, but are not lined. I love mixing this delicate and feminine blouse with a more masculine piece like the faux leather pants and the glen plaid coat. To keep the feminine theme going, I added our Pearl and Gray Iridescent Bead Necklace Set and two great new pearl and gray combo bracelets. 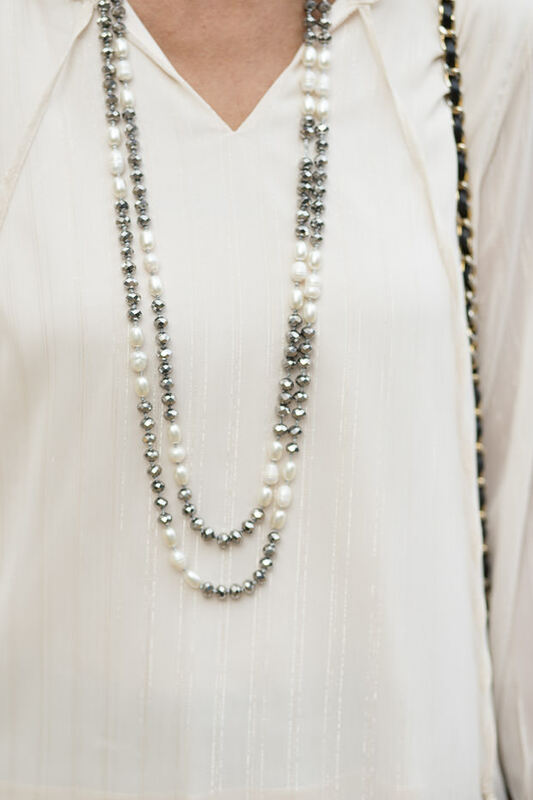 All three jewelry pieces work great together and with this outfit. Last but not least I added a great new neck tie scarf, made out of a silky fabric and printed in a fun red, black and ivory polka dot pattern. You can wear this scarf in many different ways, including tying it to you bag handle. I have shown you a couple of different options below in the photos. All six items I am showing you today are part of our 24-HR Flash Sale where you can get 15% off with code FS1127 plus Free US Shipping. All international shipments are a flat rate of $25.00. That sure is a beautiful coat! Your smile is even more beautiful!